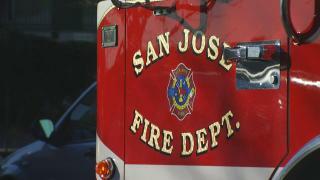 A person died early Sunday morning in San Jose after a vehicle crashed into a tree and caught fire, according the San Jose Police Department. Officers responded to Silver Creek Valley Road and Farnsworth Drive at 2:55 a.m. on a report of a vehicle fire. When the San Jose Fire Department extinguished the fire, a single body was located in the interior of the vehicle, police said. A preliminary investigation revealed the vehicle struck a tree in the median and caught on fire. The victim had not been identified yet. It was San Jose's 31st fatal collision of the year, police said. Anyone with information is asked to contact Detective Kevin McMillen of the San Jose Police Department's Traffic Investigations Unit at 408-277-4654.